Published in The Telegraph, Kolkata on 30 December, 2015. Listening to the acrimonious debates surrounding West Bengal’s inability to attract high profile investments, an economist ought to ask two important questions; ques-tions which might even appear to contradict one another. First, why are investors reluctant, if they indeed are, to invest in the state? Second, will a surfeit of investment help to eradicate the scourge of unemployment afflicting this economy? Before proceeding to address these questions in turn, it is worthwhile to ask a third investigative question pertaining to the factual scenario. 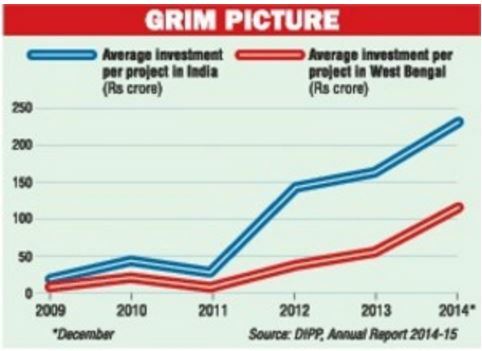 Is West Bengal truly lagging in terms of investment? The Annual Reports of the Department of Industrial Policy and Promotion (DIPP) published by the Ministry of Commerce and Industry can help resolve this issue. The latest report for 2014-15 throws up data on investment expenditure in the country during the period 2009 through December, 2014, listing in detail the number of investors and the corresponding total investments undertaken annually in the different states as well as the country as whole. For the sake of simplicity, however, it is helpful to study an average figure, investment per project, for the entire economy and that for the state of West Bengal. As the graph illustrates, West Bengal trails behind the country in terms of this average and that the gap appears to be increasing. The figures are not corrected for inflation of course, but the character of the picture is unlikely to change even if the calculations were to be carried out at constant prices. Although West Bengal is worse off, it is suffering from a relative disadvantage at worst. In absolute terms all parties are affected. It is in this context that the first question assumes relevance. Why are potential investors shy at all, of investing not merely in West Bengal, but elsewhere as well? The science of economics, sadly, has no straightforward answer to the question, except to point out that entrepreneurs as a class cannot foresee with clarity whether the potential produce flowing out of the factories and machineries they set up will be matched by a demand for it. An unwillingness to install equipment results then from gloomy expectations about the future. And this, irrespective of the availability or otherwise of adequate infrastructure, cheap labour or what have you. Indeed, a shortage of infrastructure could not possibly have unleashed the sub-prime crisis in the US or the financial crisis of the far east in the late nineties. Infrastructure, such as electricity, roadways and ports are surely necessary to attract investment, but they cannot guarantee that investment will actually arrive. If Keynes was right, and nothing noteworthy has happened to the world’s economies in the course of the 80 years or so since the publication of the book to prove him wrong, then large entrepreneurs, foreign or local, are possibly viewing the prospect of setting up shop in West Bengal (as well as in a few other parts of India) no differently from arranging a cricket match in Antarctica. Politicians travel far and they travel wide, governments create single windows, hold business summits and rope in stalwarts from the world of entertainment or sports to anchor reality shows, and ministries are said to be at their wits’ end to convince Central Banks to lower interest rates. But whether these campaigns will touch the right chords in entrepreneurial hearts and arouse their animal spirits remains as obfuscating a query as the mystery of the Holy Grail. So much then for the colour of the carpets being rolled out to invite private investment. The stage is ready now to face up to the second question. Can a growing investment expenditure path serve as a panacea for every possible economic malady, in particular one as painful as unemployment? Although it is generally believed that investment cures unemployment problems, modern technology, which is moving rapidly towards automation, appears to suggest otherwise. Except for the super-skilled, labour is being relegated progressively to the status of a superfluous factor of production. Uninterrupted growth of investment in modern technology may then be accompanied by a concomitant growth in traditional labour intensive production processes. This is apparent from the way unregistered manufacture has been behaving in West Bengal for the last few years, its annual rate of growth being consistently higher than that of registered manufacture. Quite apart from the automation question, a steady rise in investment expenditure, as Evesy D. Domar had pointed out in the distant past (1947), impacts the economy in two distinct ways. First, the expenditure creates incomes, and expenditure out of incomes create further incomes and expenditure. The total expenditure so generated represents a growth in demand for produced commodities via the so-called Keynesian multiplier channel. Second, investment in plant and machinery brings about an expansion in the capacity to produce more commodities. The stream of demand is determined by the propensity to spend out of investment led income growth. The second effect, viz. the expansion in capacity is a technology driven matter. There is no reason why capacity expansion should be matched by the demand expansion. If the former should exceed the latter, then excess capacity would emerge, which in turn may dampen the flow of investment. And the latter could end up throttling the growth in demand too. Needless to say, an open economy will not depend on investment generated domestic demand alone. A surge in investment and capacity growth in China for example catered to large scale exports. Not that the multiplier led improvement in domestic demand was a silent bystander in China’s success story; but the fact that few or no commodities that do not display a “Made in China” stamp are sold in the US (or even in India, if one restricts attention to specified groups of commodities), proves that exports played a major role in lifting up the Chinese economy. And now that Chinese exports have weakened following the indifferent performance of world markets, even crude oil prices have assumed a wistful weeping willow appearance. China’s domestic demand has not been able to save the situation. There is yet another major factor that needs to be borne in mind in the Chinese context. Keynes’ overt reference to political and social atmosphere is soaked in wisdom. One hears of incidents in China, such as waking up workers for Apple Industries in the middle of the night to ensure that a sudden arrival of order may be attended to with alacrity. A democratic society, however corruption ridden it may be, can hardly hope to replicate such tales. Investment therefore, even if indispensable, can bounce back as well.